In August 2018, Greek Prime Minister Alexis Tsipras announced an 11 percent increase in the country’s minimum wage. This increase signaled the end of almost a decade of being on a financial life support based on draconian austerity conditions imposed by the lenders - mainly the euro zone and the International Monetary Fund. Greece was the hardest hit EU member by the sovereign debt crisis of 2008: the Greek economy was on the verge of collapse, causing lenders to step in with a total of $330 billion in three bailouts to keep the Mediterranean country afloat. 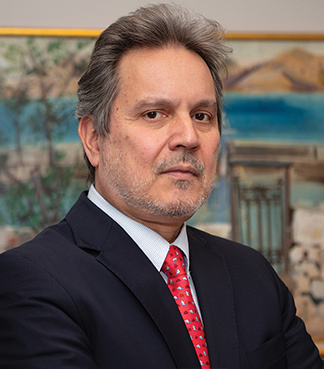 In a recent interview with Diplomatic Connections, Greece’s Ambassador Haris Lalacos, said the EU’s strategy focused exclusively on austerity without growth and left a deep residual bitterness in Greece. “We needed the right mixture of both, and we got only one,” he said. Much of the bitterness was directed at Germany, the main lender, especially German Chancellor Angela Merkel and her determined insistence on an austerity strategy. But in January, when Merkel visited Athens for a kind of victory lap at the success of the bailout, the Greeks gave her a warm welcome. By 2018, Greece was off the euro life support; its economy had returned to growth, and was on the upturn, in the short and medium term. To finance its debt, Athens was running a budget surplus, as its lenders require through 2060. Unemployment has fallen to 20 percent, but is still among the EU’s highest. The ambassador also discussed tensions between Greece and fellow NATO member Turkey, based in part on an almost 100-year old treaty, signed in Lausanne, Switzerland in 1923 to establish borders between the two countries and elsewhere in the Middle Eastern region following World War I. Turkish President Recep Tayyip Erdogan has called for a revision of the Treaty of Lausanne, but Ambassador Lalacos said Erdogan’s request was a non-starter. Diplomatic Connections: Mr. Ambassador, you are no stranger to the United States. You graduated from Amherst, and then from the School of Advanced International Studies at Johns Hopkins University (SAIS). How did that come about? Ambassador Lalacos: In Greece, I went to a Greek-American school, Athens College, which actually helps interested students who want to further their education at colleges in the United States. I wanted to see if I could get a scholarship to study in the U.S. I was fascinated by the idea of moving across the Atlantic for college and seeing something that I hadn’t seen before. I managed to get a scholarship, and one that was very generous. Diplomatic Connections: And from Amherst, you went straight to SAIS. Ambassador Lalacos: Straight to SAIS, where I followed a two-year program in international relations. The first year I chose to spend at the SAIS campus in Bologna, Italy, and the second year here in Washington. I graduated in 1983 with a major in Latin American studies. Ironically, in my more than 30 years in the foreign service of Greece, I have never served in a Latin American country, or at the Latin American directorate in the ministry of foreign affairs. Diplomatic Connections: Isn’t that typical in a bureaucracy? Ambassador Lalacos: It happens, but I’ve had many interesting assignments. Diplomatic Connections: Which has included a previous embassy posting in Washington? Ambassador Lalacos: Yes, I was political counsellor at the Embassy of Greece from 2000 to 2004. Ambassador Lalacos: I think what’s peculiar in Washington as a capital is the fact the foreign diplomats may find it confusing at first, but they will also see that they can open many doors. Not all doors open easily, but persistence offers access to those who continue to try. Overall, it’s a much more complicated capital than most of the other capitals where I have previously worked because you have many different centers of power and interest. Yet, it is possible, if you also have the right staff, to understand what’s happening and to educate all the relevant people of the greater government of the United States about your country and about common interests. That’s what we are trying to do, and I don’t think that this has changed very much since the last time I was here. The change that I see in Washington has to do more with the city itself, not the diplomatic life. Washington is becoming more of a diverse city. Diplomatic Connections: How would you characterize the bilateral relationship with the United States? Ambassador Lalacos: The bilateral relationship is at the best possible point since after World War II. This became apparent with the first ever Strategic Dialogue between the two countries, conducted in Washington on December 13, 2018, at the level Secretary of State/Minister of Foreign Affairs. The U.S. fully appreciates the stabilization of initiatives by Greece in the Eastern Mediterranean and the Balkans, in particular our strong cooperation with key countries like Israel and Egypt, as well as the Prespa Agreement, which resolved a long-standing agreement with our neighbor, the Republic of North Macedonia. [Prespa ended a long dispute between Greece and its northern neighbor over calling itself Macedonia, in part because there’s already a Greek province called Macedonia, and also for historical reasons.] It was a tall order for us and for the United States to bring the relationship higher than where it was because the two countries have always been friends and allies. However, in the past decades, the relationship was enhanced, it became wider, deeper, more far reaching, and I think this had to do with the very positive role of the United States during the Greek debt crisis. The U.S. saw correctly, and appreciated fully the geostrategic value of a stable, democratic Greece, and it helped the Greek government during this difficult time to manage and keep the country afloat and, eventually, to get out of the recession, to get out of the programs for economic restructuring, and to be, for a second year in a row now, back to positive growth, declining unemployment and a brighter economic outlook. Diplomatic Connections: What is the bilateral trade situation? Ambassador Lalacos: Our trade with the United States is very small compared to what it should be – given the very strong ties that we have in so many other areas, like defense and homeland security cooperation, including culture and energy. What we are asking is to see more direct American investment in Greece, of which there is very little. Actually, Greek direct investment in the United States is almost three times as high as American investment in Greece, which really does not look right, and we believe that it’s not right. This is a very good time for American investors to consider doing business in Greece because the investment climate has changed, legislation has improved vastly, and the privatizations are ongoing. Diplomatic Connections: Ten years after the 2008 meltdown, Greece is certainly no longer “the sick man of Europe.” So what is Greece now – the convalescing man of Europe or the fully recovered man of Europe? Ambassador Lalacos: I think there are two dimensions to my answer to your question. One is that even during the most difficult years of the debt crisis – Greece, the Greek democracy and Greek society, held together. The economic impact was such that it could crumble, not only the political system, or the economy, but also the social fabric, as it has done in other countries, in other societies. This did not happen in Greece. The political system and the people stayed together, and when the economic cycle turned upwards the country was ready again to follow this improvement. So, it’s still early, but the general outlook is positive, and optimism is up, not only among the population, but also among the international economic institutions which see Greece as a country which is now improving again, and the big bet is for us to make sure that this economic recovery is sustainable. The short and medium term perspective, according to international institutions, is positive in this respect, and we have to make sure that it stays that way. Diplomatic Connections: Greece’s current growth rate is about 3 percent. Ambassador Lalacos: The GDP is in the vicinity of about 2 percent, which may not look impressive, but for a European country, and a country coming out of a long recession, it’s definitely not negligible. Of course, we’d like to see a higher GDP growth, but the important thing is that whatever GDP growth we have, it’s based on improvement in competitiveness, and exports – economic activity. It’s not due to consumption financed by loans, which was very much the case before the crisis, and it’s precisely what led the Greek economy to a crisis. For a few years now, Greece has very considerable primary budget surpluses, which means that our country doesn’t need new loans to finance its deficits. We do not have deficits any more. Diplomatic Connections: And you don’t have to borrow? Diplomatic Connections: Which presumably will take time. Ambassador Lalacos: It will take time, but at least we have a solid economic basis, and there’s also a new mentality which is gaining ground among the sectors of the economy, and the population, for that matter. People now understand that investment, and foreign investment, will bring unemployment down. Unemployment is what makes an economic crisis real to the average citizen; people don’t rely on macro-economic indicators, but how they live in reality. Diplomatic Connections: Are the tough austerity programs that were imposed by the lenders still in place? Ambassador Lalacos: The austerity package, as it was agreed with the representatives of the creditors are no longer in place because the problem of economic recovery has been completed successfully by Greece. But we are very careful to see that the situation stays under control, that we don’t make the same mistakes that led to the crisis before. Diplomatic Connections: Given the tensions during the crisis between Athens and Brussels, what is the public attitude towards the European Union now? For example, if an in-out referendum on EU membership were held in Greece tomorrow, what do you think would be the result? Ambassador Lalacos: It’s fair to say that the handling of the debt crisis by the European Union left some bitterness among the Greek population, and this had to do with the fact that their focus was exclusively on austerity, and not on growth. We needed the right mixture of both, and we only got one. However, and even during the most difficult period of the crisis we never had a tendency, a movement, or a majority in the polls of people saying, it’s better for Greece to leave the European Union. The Greek population is in favor of both the European Union and Greece’s membership in the Eurozone. Everybody understands that there are certain disadvantages in having a very strong currency like the euro as the national currency; on the other hand, everybody appreciates the security that the currency provides. So, Greece has always been a very strong supporter of the European Union, or closer integration by the European Union, and will continue to be so because we see that it’s also in our national interest. We’re a country which is at the extremity of Europe, very close to a turbulent area in the eastern Mediterranean, the Middle East, and North Africa. It’s very important to have all the assurance that we can, thus we value both our membership in the EU as well as our membership in NATO. Diplomatic Connections: What are the long-term lessons to be drawn from the way the financial meltdown was handled by the European Union? Ambassador Lalacos: The financial crisis in Greece confronted the EU group with a new problem -- a crisis in a country that does not have its own currency, but has a wider currency. When the recovery package was put in place by the EU and the IMF (International Monetary Fund) together there was no recourse to devaluation of the national currency, which is usually where all IMF recovery programs start. This led to an economic stagnation which had to be covered by higher taxes because we needed to raise revenue, and this again created a vicious circle which was never actually fully corrected. I think that what’s important for the European Union – to find ways in the future to address such issues with the correct mixture of fiscal austerity and economic growth. It’s not just because this is easier on a country or because it’s more popular with the people of a nation - that too, but it’s also because of the fact that otherwise you end up in a downward spiral precisely because you have to keep raising taxes, which works against any possibility for growth and recovery. Diplomatic Connections: What about the decision-making process? Ambassador Lalacos: The European Union has always worked on the basis of consensus; this is the only way it can work. And, although sometimes people think that the European Union is late in addressing new challenges and situations, you have to take into account that a consensus has to be built among 28 countries with different governments, priorities and economic levels. But this is necessary. What could be corrected perhaps is the rate at which it reaches consensus. If you change this underlying concept about the European Union, then I don’t think it would be tenable. Diplomatic Connections: How does Brexit impact Greece? Ambassador Lalacos: Financially, we will have to see. In our studies, from what we can tell right now, Greece is not going to be among the countries in the European continent that will be impacted most. However, we need to see what the final arrangements will be for different areas covered by the European Union, such as freedom of movement. Many Greeks live and work in the United Kingdom, and vice-versa, British citizens work or live out their pension years in Greece. So we’ll have to see how these people will be affected. My daughter works in Manchester, England, and she also would like to know what will happen to her. For Greece, Brexit was not a welcome development. Greece was in favor of every country of the EU remaining in the EU. In the case of the United Kingdom, because it’s one of the bigger countries in the European Union, we feel that it’s in the interests of the Union to have different voices, and to have checks and balances, which larger states can perhaps provide more than the smaller states. Although Greece and the United Kingdom do not agree on every issue inside the European Union, it will be a loss if the UK leaves the EU. Diplomatic Connections: You will admit, though, that the Brits have always been awkward partners in the European Union. President De Gaulle, in rejecting the British application for membership on two separate occasions in the late 1950s and mid-1960s, said they were not committed to the European idea. Ambassador Lalacos: Back then it was the European Union of six countries and they had many similarities between themselves. Now, the European Union comprises almost every country in the European continent. It’s a new equilibrium. Then, it was the European Economic Community, now it’s a union, and with the Lisbon Treaty especially, it’s a very advanced union. Greece is in favor of it, and we believe that it’s ultimately in the interest of the European Union to have countries which may be difficult at first. You have to have them inside the European Union and try to take their peculiar concerns into account, otherwise there will be a rift inside the European continent. What we need is what we are trying to achieve, a greater degree of uniformity and freedom. Diplomatic Connections: Last year, President Erdogan visited Greece, and it was the first visit by a Turkish head of state in more than 60 years. Erdogan promptly demanded a revision of the Treaty of Lausanne. What is the current state of the Greek-Turkish relationship? Ambassador Lalacos: The relationship between Greece and Turkey has been a very special one over the centuries. I have spent a total of seven years at the Greek Embassy in Ankara in two different postings, and what I see is that we have issues which still have to be resolved; nevertheless, progress has been made in some ways in our relationship, which is reflected in the frequency of high level meetings. Following the Erdogan meeting, we had a more recent visit of our Prime Minister Tsipras who met with President Erdogan. Follow-up meetings have already taken place; for instance, a meeting of the two defense ministers in Brussels was held a few days ago. We’re in a constant quest to defuse tensions and to seek ways of communication, and to establish a climate which will enable us in the future to sit down and see how we can resolve significant issues between our selves – that are still outstanding. We also need to see how the two countries can help the process for the re-unification of Cyprus. Diplomatic Connections: Isn’t that one of the issues? Ambassador Lalacos: Well, the Cyprus issue is not a bilateral issue between Greece and Turkey, it’s an international problem. Diplomatic Connections: So what issues are you referring to? Ambassador Lalacos: We need to find a solution to the issue of delineating the Continental Shelf in the Aegean Sea. This will enable the two countries to know exactly what our maritime zones are, and how we can take advantage of those zones, including drilling for oil and natural gas. But the more general question that we are facing is the Treaty of Lausanne. This is just one way that we see – Turkey wants to revise existing treaties and the existing status quo, which were the product of a compromise. They’re not one hundred percent to the liking of Greece, but we fully respect the provisions of the treaties because that’s what we have agreed. Diplomatic Connections: Agreed in 1923. Ambassador Lalacos: Yes, but this is still a valid international treaty, not just a bilateral treaty between Greece and Turkey. We’re not going to enter into any discussions about revising the Treaty of Lausanne. We’re willing to sit down and have an exhaustive dialogue in order to find ways to cooperate, overcome perhaps some misunderstandings, and make sure that both countries act according to international law. Otherwise, there’s no room for discussion. It’s a difficult task, but we are determined to continue to be engaged in a process of rapprochement with Turkey, of dialogue, and hopefully of overcoming the present situation which we find totally unacceptable. Diplomatic Connections: Meaning what, exactly? Ambassador Lalacos: On a daily basis we have violations by the Turkish air force of our national air space, our territorial waters, even overflights of Greek islands by Turkish fighter jets. These are acts we’re not leaving unanswered, but this takes a toll on our armed forces, on the expenses we have to incur, occasionally on human lives of pilots who are on a daily basis are on the alert to intercept these violations. Ambassador Lalacos: It is ironic that we face a constant provocation by a NATO ally, but it’s a reality and it must be dealt with. Diplomatic Connections: What is it that the Turks want changed in the Treaty of Lausanne? Ambassador Lalacos: Oh, there are many claims, some open, some covert, some related, some not directly related to the revision of the Treaty of Lausanne. The treaty does not only cover relations between Greece and Turkey. It covers relations between Turkey and all its neighbors, including the countries in the Middle East, so even the idea of beginning to revise the Treaty of Lausanne leads to incredible instability, especially on Turkey’s southern and eastern borders. Diplomatic Connections: The Arab Spring, and the Syrian conflict launched an enormous flood of refugees across the Mediterranean, and over a million displaced Syrians poured into Greece. What is the refugee situation now? Ambassador Lalacos: We still have refugees coming to Greece on a daily basis, and the numbers are significant, but not anywhere near the 1.2 million people who came from Turkey into Greece in less than 12 months in 2015, early 2016. It’s still a big issue, however, and we don’t know how it will evolve. Diplomatic Connections: It’s not a bilateral issue, is it? Ambassador Lalacos: It’s not a bilateral issue, it’s not even a regional issue. I think it’s a global issue. That’s why we’re trying to have more involvement of the world community, and certainly the EU in trying to address it. Greece is one of two European countries, the other being Italy, which seem to be the preferred gates of entrance for undocumented refugees. Diplomatic Connections: Well, and Malta. Ambassador Lalacos: And Malta, yes. This is, of course, because of our geography. It has to do with the fact that, especially in the case of those coming to our islands by small inflatable boats, under international and humanitarian law you cannot push them back. You have to actually rescue them and help them when they come to the islands. But then, how do you proceed from there? The EU now has an agreement with Turkey about refugees, which is working, perhaps not perfectly, but well enough. Although, it’s not the solution to the problem, and it will not be an adequate arrangement in case the refugee flow goes up again. Diplomatic Connections: Mr. Ambassador, one last question regarding technology and diplomacy: do you tweet? Ambassador Lalacos: I had given this a great deal of thought before arriving here as ambassador to the U.S. – whether I should rely on the embassy twitter, Facebook and other social media accounts, or to create one of my own parallel to the embassy accounts, which some of my colleagues have done, and others have not. I discussed it with another of my European colleagues when I got here initially, and I reached the conclusion that it was best to have one message emanating from the embassy covering also my personal activities, but as well as the activities of others, not differentiating between my person as ambassador, my position, and the rest of the embassy. We are one organic unit, we work as a whole, everybody has his or her areas of responsibility and I think that it’s better that our message is one. 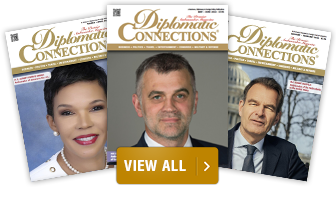 Diplomatic Connections: But as technology continues to advance, is diplomacy a shrinking profession? Ambassador Lalacos: You don’t see it being a shrinking profession anywhere in the world, despite tele-communications being where they are. Every nation sees that embassies, ambassadors, and other diplomats still have a function, and I don’t think that we have arrived at the point yet where one country can be represented in another country only by way of electronic communication. We see that human contact is still very important, in some ways perhaps even to a greater extent than it was in the past. The more you work in Washington, the more you see how important it is to have personal connections to the key people who deal with your country in this capital; it’s something that cannot be done from a distance. And it cannot be done by people who are based in the headquarters – in my case Athens – who deal with the entire world. Here we deal with the United States only, and we see how human contact is significant, at the highest levels, at mid-levels and at the lower levels of diplomacy. The nature of our work is often transitioning because of changes in communications. The volume of our work goes up considerably, but I’m confident that we’re not close to the era where diplomats will be obsolete. Diplomatic Connections: Thank you, Ambassador Lalacos. This has been an interesting interview.